We are looking for Export Inquiries for Nutri Calcium from UAE, Africa, Russia, Egypt, Turkey, Sri Lanka and Vietnam. Nutri Calcium is a bio available source of Calcium manufactured with the help of fermentation process. 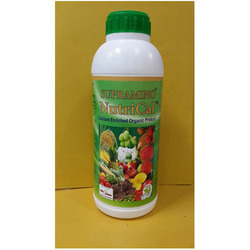 It is fortified with gluconates and lactates with are easily absorbed and assimilated into the plant system, thus process beneficial for the overall plant growth. It helps the crop to develop resistance against disease. It is highly compatible with all chemicals and pesticides. Packaging Details: ONE LITER PACKED IN A CARTON, 10 LITERS PACKED IN A CARTON, 1360 SUCH CARTONS TO FIT ONE CONTAINER LOAD ABILITY FOR A 20 GP CONTAINER. OUR MATERIAL IS ORGANIC AND DOES NOT REQUIRE STANDARDS SIMILAR TO HAZARDOUS MATERIAL FOR SHIPMENT.